Suzan Johnson Cook is a religious leader, pastor, motivational speaker, and diplomat who was born on January 28, 1957, in Harlem, New York. Her father, Wilbert Johnson, was a trolley driver and later founder of a successful security company, and her mother Dorothy Johnson, was a public school teacher. The parents moved their family to the Bronx, New York, where young Suzan was raised. Johnson Cook earned several degrees including a bachelor’s from Emerson College (1976), a master’s from the Teachers College at Columbia University (1978), a Master of Divinity and Doctorate of Ministry from Union Theological Seminary (1983 and 1990 respectively). From 1983 to 1996, Johnson Cook was senior pastor at New York’s Marine Temple Baptist Church and a professor at New York Theological Seminary from 1988 to1996. In 1990 she became the first female and African American to be named New York City Policy Department’s (NYPD’s) chaplain, a position she held for twenty-one years. In 1993 Johnson Cook earned a White House fellowship, where she advised President Bill Clinton on a range of domestic issues. She then consulted for the secretary of the Department of Housing and Urban Development on faith-based initiatives from 1994 to 1997. President Clinton later appointed Johnson Cook to serve on his National Initiative on Race as his only faith advisor. In 1996 near the end of her service to the Clinton administration, Johnson Cook founded the Bronx Christian Fellowships Baptist Church, serving as its senior pastor and CEO until 2010. 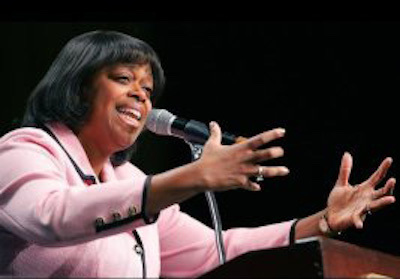 In 2002 she also become the first woman to serve as president of the influential Hampton University Ministers’ Conference which represents all the major historically black religious denominations. Over her career, Johnson Cook traveled abroad to engage various religious groups. She has led interfaith delegations to Israel, Jordan, and Egypt, and throughout the Caribbean. She also worked with the nongovernmental organization World Vision in its efforts to combat global poverty, and traveled to Zimbabwe and South Africa to meet with Zulu faith leaders to promote interfaith dialogue and tolerance. Earlier in her life, she had also traveled across Africa with her friend, Yolanda King, daughter of Martin Luther King Jr. This led to a lifetime friendship with the King family, including Coretta Scott King, at whose funeral Johnson Cook led the opening prayer in 2006. In 2010 President Barack Obama appointed Johnson Cook to be the U.S. ambassador-at-large for International Religious Freedom, a position created by the International Religious Freedom Act of 1998. After being confirmed by the U.S. Senate, she was sworn in on May 16, 2011, making her the first woman and first African American to hold this position. Her main responsibility was advancing the president’s agenda on promotion of the right to freedom of religion as a universal human right across the globe. Ambassador Johnson Cook left her post in October 2013, returning to private life as a minister and motivational speaker. In 2015 she announced her intention to run for the U.S. congress, hoping to fill the soon to be vacant seat of long-time member and civil rights advocate, Congressman Charlie Rangel, who had announced his retirement. Ambassador Johnson Cook is married to Ronald Cook and the couple have two sons. “Who’s Here: Suzan Johnson Cook Ambassador-At-Large” by Dan Rattiner, 2013; The History Makers, “Rev. Dr. Suzan Johnson Cook”; U.S. Department of State, Official Biography.